← Take a deep breath and….jump! I am listening to the Black Keys’ El Camino as I write this. In case you were wondering. After this, I will listen to my Christian Kane playlist on Grooveshark. I seem to get a lot done when I listen to Christian Kane. I also get a lot done when I allow myself to be a little ADD about it. Going straight down a “To Do” list never works that well for me. It’s more efficient for me if I work on several things at once as I wander from room to room. Wash the dishes while I’m in the kitchen, write a few addresses in my book when I move some mail from the kitchen to the bedroom, put away the sofa bed after I take an old receipt that I found under my bed to the living room for shredding. I wish I could figure out how to make this happen at work. Borrow my colleagues’ offices for various tasks, that is. I think the getting things done has something to do with constantly being on the move from one end of the apartment to another. I like making lists of things to do. When I lived in Chicago I started a tradition of making a list of 50 things to accomplish in the new year. The lists were supposed to be written round midnight on New Year’s Eve and were supposed to be completely stream-of-consciousness so that I didn’t stop myself from dreaming big. They often included items like “Meet Matthew McConnaughey in a meaningful way.” I cut it down to 25 a few years ago, but this year I found myself scribbling on past 25 items. And it’s not quite stream-of-consciousness anymore, but I try not to labor over it or weigh the practicalities either. My sister also makes a list, and I just found out that for 2012 we both want to learn how to swim. My list includes prayer, going to arts events, writing, sending out submissions, cooking, and lots of other stuff. The most important items on the list—well, next to prayer and reading the Bible—are the four times I included “Do something that scares me.” Though I suppose reading the Bible and prayer counts as one of those things that scare me, partly because I don’t want to turn into my mother circa 1983 when she was so zealous that I turned my back on God cause all the joy was leached out of my relationship with him. And of course there’s that whole be all you can be thing that a relationship with God enables that, as I wrote yesterday, also scares the crap out of me. By the way, in case you haven’t noticed, this blog post is incredibly influenced by Stephen Elliott’s Rumpus e-mails. Someday I should tell him that. 3. Have Ross [Bon] as a friend and colleague. Posted on January 2, 2012, in Uncategorized. Bookmark the permalink. 2 Comments. It was very early in 1999, remember. Grunge was still around and lots of girls in Chicago were wearing them…which is why they had them at Target. 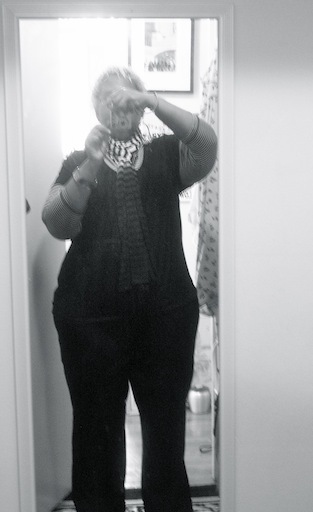 And I looked darn cute in mine…though I had to roll up the bottom a zillion times!